We promise you Free Coupons That Work always. We will provide you with best experience by showing only coupons that we test at-least once a day. 1. CouponRani.com : Leading and fast growing site for coupons, offers and deals in India. 2. Blog.CouponRani.com : Best source of curated set of hot deals. 3. India Discounts Chrome Extension : A Chrome Extension that makes coupons available to the consumers without leaving your shopping site. 4. Coupon API : An API for our B2B partners, who would like to offer coupons to enhance their product offering and increase revenue. Couponrani.com is a leading and fast growing website that is dedicated to provide its users free coupons, offers and deals in India. The layout of the website is simple, neat and easy to navigate. You will see lots of coupons and deals of most of the online shopping sites including the top ones like Myntra, Jabong and Snapdeal. You can use the coupons without signing up but I had already subscribed for newsletter to get the coupons and offers right in my mailbox. 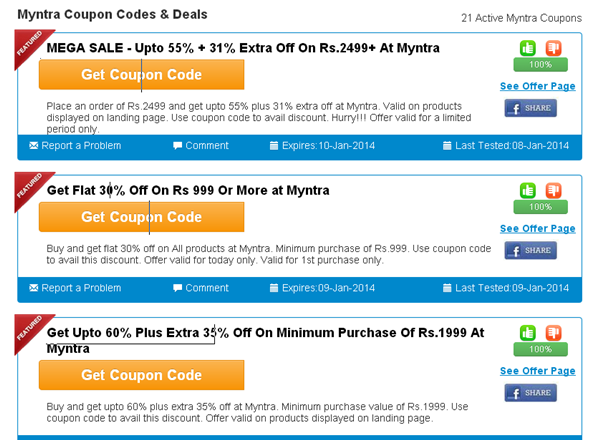 Recently I bought few bags from Myntra and to my surprise I saw an amazing deal through CouponRani. I got 50% off and an additional 31% off on my purchase. As soon as you click the ‘Get the Coupon Code’ button, the coupon will be copied automatically on the clipboard and you will be directed to the home page of the desired website. You just need to paste the coupon code at the time of checkout. 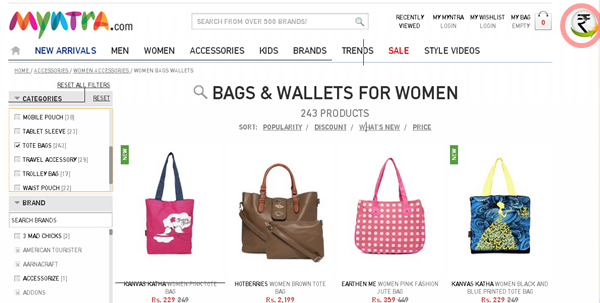 CouponRani offers lots of coupons from a large number of online shopping websites. I was surprised to see that there are many sites I am unaware of. Thank you CouponRani for increasing my knowledge! 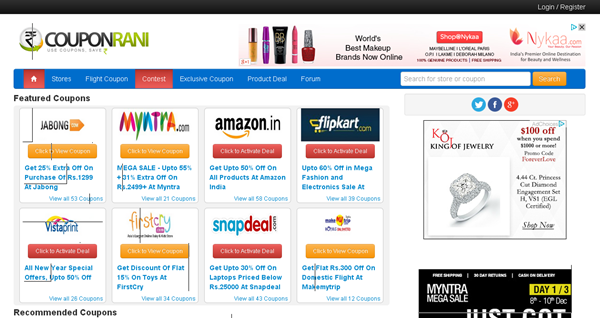 It also offers Chrome Extension feature that helps you choose coupons without leaving the website. 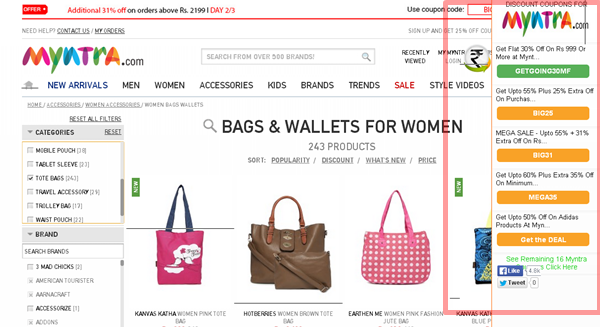 As soon as you install the extension on the chrome, you will see CouponRani icon on the right hand side of the shopping website. You just need to hover over the icon and a list of coupons will pop up displaying all the latest coupons of that particular website. This way it helps you to shop wisely without wasting your time. CouponRani offers latest coupons of almost all the leading online websites in India like Myntra, Jabong, Flipkart, Amazon, Snapdeal, Goibibo, Dominos, MakeMyTrip etc. It is the first ever coupon site I have come across that offers coupons of such a large number of retailers and online sites. It has a separate tab for Flight Coupons that makes the task all the more easy (my fiancé just love this site as he gets to see offers on flights at one place!). It also offers bus coupons and hotel coupons. I always make sure to check CouponRani whenever I plan for traveling. • Coupons of a large number of retailers and websites. • Chrome extension feature that allows you to choose coupons on the website you are shopping from. • I really could not think of any. Overall I am totally in love with Couponrani.com. It provides me latest coupons of all the shopping sites I love. It helps me in saving my money without wasting my time. It keeps its site updated with active coupons. You can find deals and coupons of almost all the major and leading websites and retailers in India. I would highly recommend Couponrani.com to all online shopping lovers! Have you tried Couponrani.com? How was your experience? Share in the comments below! Do try Gowthami. They do have many offers! This looks great, worth checking, will try them out. Do give them a try Richa! Rs. 250 discount on all domestic flights on ONE WAY. Thanks for sharing this interesting or informative blog about couponrani, it sounds great actually we have online shopping website and want to create some coupon and give offer for increase my sale how it is possible.